We have a lot of experience in this area, mainly with adults, to which we offer a series of tools that can help them better understand, transform or improve their environment. We have strong background on Educational Programs design, didactic and pedagogic resources design and courses/training programs. Educational team of the “Neighborhoods in Transition” project. University of Seville in collaboration with the Ministry of Housing of the Junta de Andalucía, 2014-2015. Publication: “Between two equal and different continents”. 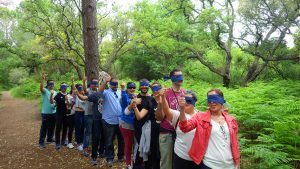 Didactic Unit on the educational resources of the Intercontinental Mediterranean Biosphere Reserve. Agency of Environment and Water. Ministry of Agriculture, Fisheries and Environment, Junta de Andalucía. Publication “Doñana en Perspectiva”. Didactic material to incorporate the Doñana National Park into the official primary education curriculum. Ministry of Environment. Junta de Andalucía. Training program for environmental educators in Andalusia. Ministry of Environment of the Junta de Andalucía. Program of Formation of the Andalusian Institute of the Youth. Andalusian Program of Environmental Training of the Regional Government of Andalusia. PAFA. Ministry of Environment of the Regional Government of Andalusia. CENEAM Training Program (National Center for Environmental Education) linkd to the Ministry of Agriculture, Food and Environment. Continuous training of the Tripartite Foundation. We are accredited as an organizing entity. Technical Assistance for the Andarríos Environmental Volunteering Program related to citizens engagement on rivers conservation in Andalusia. It has involved hundreds of entities and thousands of volunteers. We have developed educational materials, designed and managed the volunteering program. Main tasks have been: coordination and communication with associated entities, reports compilation, meetings and seminars organization, etc. Ministry of Environment, Junta de Andalucía, 2006-2012; 2014-2015; 2016-2018. 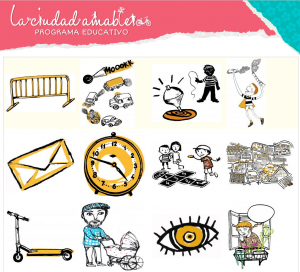 Advisory and execution of the neighborhood engagement plan in “Las Huertas” neighborhood within the project Aqua-Riba. Main goal of this project was to incorporate sustainable measures in the urban water cycle management for comprehensive rehabilitation plans. University of Seville in collaboration with the Ministry of Development and Housing of the Junta de Andalucía, 2013-2015. Volunteering Camps for the Conservation of the Iberian Lynx. 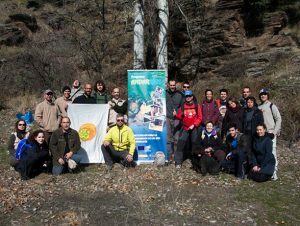 Within the LIFE european Program “Conservation and Reintroduction of the Iberian Lynx in Andalusia 2006-2011”. Spanish Society for the Conservation and Study of Mammals (SECEM), 2007-2010. We have undertaken a new line of self-managed work within the framework of ecotourism, carrying out nature routes that show the values of our biodiversity and also their threats to people all over the world. 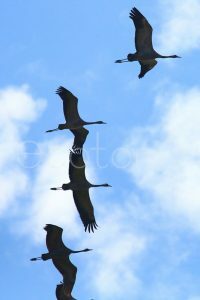 2014-2017: Ecotono Birding Seville. Initiative that aims at the conservation of our ecosystems through the promotion and practice of quality tourism and the engagement with conservation projects. We take small groups on tour (english and spanish spoken) so that they know the best wild life sanctuaries of western Andalusia. 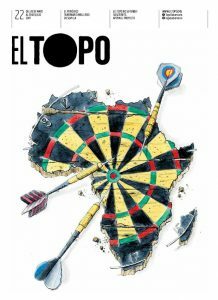 Independent Self-managed newspaper EL TOPO covering eco-political and local social issues and news. 2013-Nowadays. Environmental Volunteer Magazine “En Acción“. Technical assistance. Andalucía Ministry of Environment. 2005-2013. “I get up every day, considerations on sustainability“. FAFFE Fundación Andaluza for Training and Employment. 2005. “Practical Guide to Environmental Volunteering: River Conservation“. Ministry of Environment. Junta de Andalucía. 2006. Documentary film “Re-Mujeres, six feminine visions to transform the world day by day“. Awarded documentary film project in the festival of Young filmmakers of Andalusia with the GEODA prize of Woman and Environment. 2005. Audiovisual “Fish in the desert“. Yes, in the desert. A group of enthusiastic naturalists pursue the fishes and other aquatic animals that live in the most arid area of Morocco. The troubles for surviving in such a hostile environment interwine with the difficulties to do science when the taste for pure knowledge is lost. Documentary in Spanish, with French and English subtitles. It collects the work of scientists from the EBD, CSIC sampling rivers in unusual places around the Moroccan Atlas. 2014-2016.